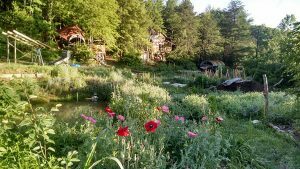 The home of Wild Abundance is a breathtaking 7 acre eco-homestead. We’re nestled in a rich cove amidst likeminded land stewards in the Southern Appalachian mountains, just 20 minutes north of Asheville, NC. 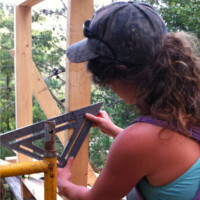 Here, we teach practical skills for living with the land, plus offer inspiration and build connection amongst our students, apprentices, instructors, and staff. Wild Abundance boasts a gorgeous and bountiful leaf-shaped organic permaculture garden, delectable perennial beds, a log cabin built from trees from its own growing forest, a light straw clay porch, a cob oven, a stunning wattle and daub outdoor kitchen and classroom featuring a hand-made sun sculpture completed by loving students, and dramatic views of the Blue Ridge Mountains. In just five years, what was once a barren piece of land, grazed and trampled by cattle, was transformed into a thriving homestead. Our campus fosters native plants, wildlife, a sweet herb garden located strategically near the kitchen, and even a food forest. Every single permaculture principle has been thoughtfully applied to each and every addition to the land, honoring the natural patterns and cycles of life. This is a place where students learn by example. They get to soak up the beauty and functional efficiency of permaculture in action. Our classes cover a wide range of topics. We teach homesteading skills for everyone from the total novice to the seasoned land-manager. In addition, we offer carpentry courses with a focus on natural and sustainable building modalities, including tiny houses. 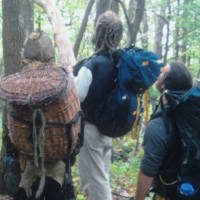 We get students out into the fields and woods with our foraging and herbal medicine classes. Through rewilding classes we teach hands-on skills like hide tanning that help students reconnect with their ancestral wisdom. 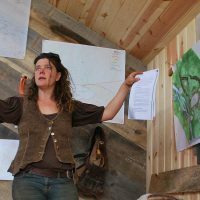 Tying it all together, our permaculture courses teach systems thinking and interconnection. Check out all of our class offerings here, there really is something for everyone. 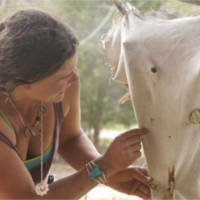 Natalie Bogwalker, the founder and director of Wild Abundance, has devoted her life to empowering people to live in collaboration with the natural cycles of the Earth. 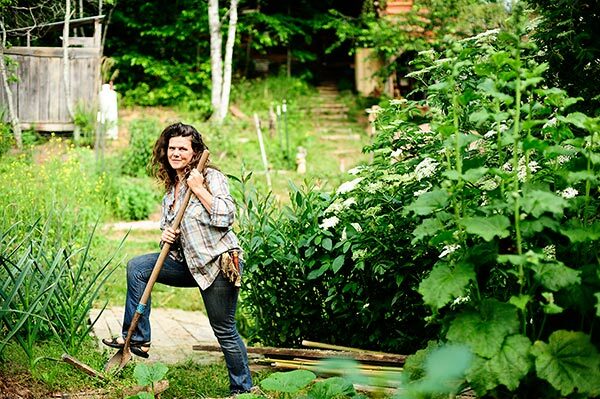 Natalie’s tireless efforts demonstrate a real-life example of successfully living off the beauty and abundance of the land. It’s because of the loving help from neighbors, past students and apprentices, and friends from all over the country that this land has been so quickly and beautifully transformed into a vibrant and distinguished homestead. Our hope is that Wild Abundance will continue to change the lives of the people who come here, and will inspire a deep reverence for our sacred and ancient relationship with the land. This campus is an invitation and inspiration to develop and foster a life that is inherently connected to the Earth and her natural cycles. 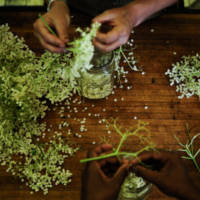 Spend three days foraging and eating wild foods in the forest near Asheville, NC. Rewild yourself with local plant experts in the biodiverse mountains. Meet wild edibles, medicinals, mushrooms, and amazing people. Learn from expert brain-tanners the process of transforming deer hide into soft, supple, beautiful buckskin, suitable for fabulously comfortable clothing and accessories. Leave the class with your very own finished hide tanned in the traditional and completely natural way. Identify and wild forage medicinal plants in the Appalachian mountains. 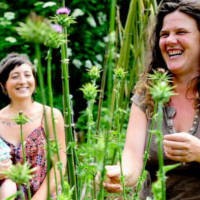 Learn to make medicine and cultivate herbs in your garden. Make and take home herbal salves, tinctures, flower essences, decoctions, cough syrups, herbal liqueurs, oxymels and vinegars. 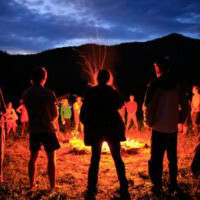 Gather with other women for a long weekend of connection, learning, and rewilding. Basketry, medicine making, cheese and soap making, wild foods cookery, friction fire, and more In the mountains near Asheville, NC. This class is intended to get ladies up-to-speed on basic building skills, working with wood, and using hand tools as well as power tools. Focus is placed on creating a safe, comfortable, relaxed and fun learning environment in which students with beginning to intermediate skill levels can thrive. Trans welcome. So, you know how to use a drill and a skillsaw and you can build a basic shelf, but you want to get proficient with building bigger things. Do you have buildings in your sights? This class will give you the skills you need for designing and constructing small buildings and sheds and will set you on the road toward more complex structures. Gain the skills you need to build your own tiny house from local, natural, or conventional materials. 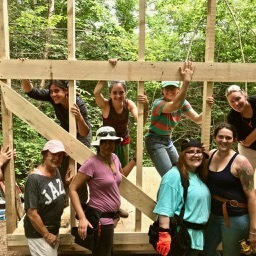 Tour beautifully crafted tiny houses and natural buildings, learn about each stage of building from expert lectures, experience hands-on learning as we build a tiny house from scratch, and practice natural plaster and paint. 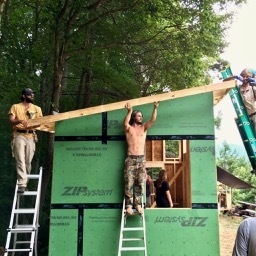 This is the most practical Natural Building Course out there. Our school is located just 20 minutes North of Asheville, NC.